Crewe Alexandra earned a hard-fought point against Bristol City to stay one place outside the League One drop zone. The visitors started well with early efforts from Matthias Pogba and Matt Tootle both going wide. The Robins came close to breaking the deadlock through Marlon Pack's shot from 35 yards. 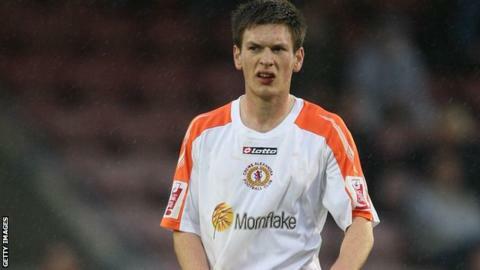 Crewe had a great chance to win it late on when the ball dropped to Tootle but his shot flashed across the face of goal from six yards. Bristol City manager Steve Cotterill: "Probably a bit of an anti-climax today, I felt it was a real party atmosphere, I felt as though we needed to score in the game. It wasn't quite that zip or that hunger that there has been in recent performances which is understandable, I've been waiting for about three weeks for that type of performance to come. "It wasn't a bad one; it was almost that easy, we could pass it for fun. But we didn't have enough penetration certainly in the early part of the game. "We needed to score a goal I felt today, I thought the crowd were terrific, absolutely terrific today, they have been since I've been at the club but I thought today they made it such a fantastic place." Match ends, Bristol City 0, Crewe Alexandra 0. Second Half ends, Bristol City 0, Crewe Alexandra 0. Attempt missed. Wade Elliott (Bristol City) left footed shot from the left side of the box is close, but misses to the right. Attempt missed. Matt Tootle (Crewe Alexandra) right footed shot from the centre of the box is close, but misses to the left. Attempt missed. Marlon Pack (Bristol City) header from the centre of the box is too high following a corner. Corner, Bristol City. Conceded by Mark Ellis. Attempt missed. Bobby Reid (Bristol City) right footed shot from outside the box is too high. Corner, Crewe Alexandra. Conceded by Bobby Reid. Corner, Crewe Alexandra. Conceded by Derrick Williams. Substitution, Bristol City. Bobby Reid replaces Simon Gillett. Substitution, Bristol City. Martin Paterson replaces Jay Emmanuel-Thomas. Liam Nolan (Crewe Alexandra) wins a free kick in the attacking half. Foul by Simon Gillett (Bristol City). Attempt missed. Anthony Grant (Crewe Alexandra) right footed shot from outside the box is close, but misses to the left. Attempt missed. Simon Gillett (Bristol City) right footed shot from outside the box is too high. Corner, Bristol City. Conceded by Oliver Turton. Attempt blocked. Sam Baldock (Bristol City) right footed shot from the centre of the box is blocked. Corner, Bristol City. Conceded by Adam Dugdale. Attempt saved. Jon Guthrie (Crewe Alexandra) left footed shot from outside the box is saved in the top centre of the goal. Uche Ikpeazu (Crewe Alexandra) wins a free kick in the attacking half. Corner, Crewe Alexandra. Conceded by Nyron Nosworthy. Second Half begins Bristol City 0, Crewe Alexandra 0. First Half ends, Bristol City 0, Crewe Alexandra 0. Attempt blocked. Mathias Pogba (Crewe Alexandra) right footed shot from outside the box is blocked. Attempt blocked. Mathias Pogba (Crewe Alexandra) right footed shot from very close range is blocked.